FROM THE RECTOR On 4th November there was a concert in aid of HOPE (Hold on Pain Eases) in the Church. HOPE offers support, counselling and a cup of tea to anybody feeling depressed, anxious or with suicidal through its drop-in centre . 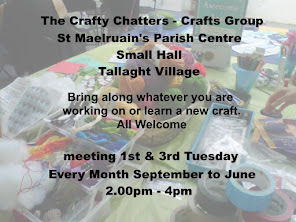 It is a community-led support group and responds to the growing demand for mental health services locally, phone 087 136 3082 Website: hopetallaght.wordpress.com for more information. The concert was organised by Anne and Philip Davison (who are also members of ‘Now and Then’). Anne writes poetry to which Philip sometimes puts to music. The concert was very enjoyable with Anne singing and Philip accompanying her on guitar. There was a crowd of appox 70 people with almost €1000 raised. Well done to Anne (who volunteers for HOPE) and Philip for an enjoyable evening in aid of such a good cause. HOPE Unit 5, Westpark Gate, Tallaght Village between the beauty salon and the IT spot (Laptop shop), opposite the Dragon Pub. Our Girl’s Brigade Company had their enrolment service on Saturday 10th November. It was decided, due to the busyness of many of the girls on a Sunday morning, to have the Enrolment Service in the Main Hall on a Saturday morning. The service was opened and closed with a hymn by our organist, Joyce Smart and was followed by the traditional cup of tea and tray bakes to round off an enjoyable morning. On 18th November we had the Boy’s Brigade Enrolment Service in the Church. I think it’s terrific with have so many officers / staff in our BB (and GB). The service was well and attended by the boys and they gave good answers during the sermon. We are very grateful to Barbara for organising the refreshments after the service. I would like to take this opportunity to wish all the readers of the Newletter a joyous Christmas and a healthy and happy New Year William. 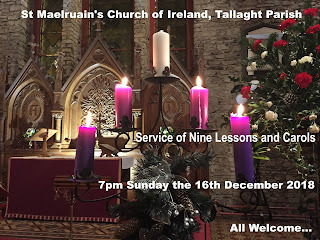 Usual Sunday services will take place on the Sundays in between. FLOWER GUILD Thank you to everybody who has helped with the flowers in the Church throughout the year, to those ladies that are on the Rota and who decorate the Church every month and to all the ladies and gents who provide us with flowers and help on the special occasions. Thank you also to Valerie and William for always being there with coffee, tea and chat for us as we work. We will decorate the Church for Christmas on Friday 14th December from 10 am to 12.30 and would welcome gifts of flowers and greenery. We also need lots of help so appeal to all the ladies on the Flower Rota and anybody else who would like to help to join us. There's a job for everyone! It's always an enjoyable morning and a chance to catch up for a chat and a cup of tea while we work. All are welcome to join us and we are always looking for new people to help. No experience necessary! Regina. SCHOOL NEWS The school has had a fun packed timetable full of great learning experiences since mid term. The Parent Association AGM took place on Fri26th Oct in the Parent’s Room, it was well attended and a new committee was elected. The school will be bag packing on Sat 8th Dec in Dunnes Stores, Citywest. Your support would be greatly appreciated. All monies raised go towards funding tablets/ laptops for literacy and numeracy support for our pupils. The children continue to take part in their extra curriculum activities with enthusiasm. Angie Kinsella from Heritage Ireland visited Junior/Senior Infants and 1st and 2nd class on Wednesday 28th November. She engaged the pupils in an Environmental Science Workshop and we enjoyed her visit. We had a Halloween Handwriting Competition before mid term. Congratulations to the pupils who received prizes for their handwriting; they received their awards based on style, neatness and presentation. The School Christmas Bazaar takes place on 14th December, Please take note of new time 12pm to 2.00pm and the School closes for the Christmas break on 21st December at 12.00pm. TABLE TENNIS As we reach the end of 2018, we say goodbye to Bobby Wilson who hopes to move house in January and so will not be returning to the club to play. We will miss him every week, as Bobby rarely missed table tennis. He was one of the founder members of the club in 1980. His wife Pat, assisted Bobby as Hon. Secretary and between them kept the club running for years. 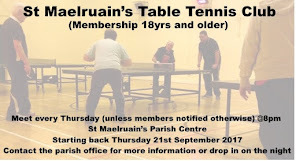 It was set up at that time as a social club before becoming a table tennis club later. Bobby, with Andrew Seymour and various members made up our first team that played successfully for years in the United Churches Table Tennis League. In latter years, the club has struggled with numbers, but dedicated as he was, Bobby, along with Andrew, Vivienne & myself, never let us down each week . He's a great friend and has the patience of a saint, willing to teach anybody with great encouragement. We are glad to say, our numbers have increased again and Bobby has been there along the route to welcome and give our new members a game. As we go to print, it is planned to present Bobby with a farewell gift at the Parish Coffee Morning on Friday 30th Nov, where we hope some of the original club members may be in attendance. We will close for Christmas on the 13th Dec & wish everybody a very Happy Christmas & New Year. BOWLING CLUB We have a lovely new kitchen in the main hall thanks to three members of our bowling club who gave up a lot of time and energy to give us a fantastic updated kitchen. We also bought new chairs for our club. WHIST DRIVE Our next Whist Drive take places on Monday 17th December in the Small Hall, all welcome! 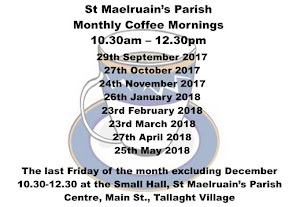 PARISH COFFEE MORNING We will have a break in December and we wish everyone a very happy, healthy and peaceful Christmas. We return again in the New Year on Friday, 25th January at 10.30am - 12.30pm. All welcome. MOTHERS UNION We had our November meeting on 12th November and our speaker was Geoff Scargil from the charity Protestant Aid. We had a reasonable turn out with a few apologies on a miserable night. Geoff gave us a very interesting talk on the organisation and it's history and how even though we would be led to believe that the recession is over it is still much needed and a lot of people are in great need of financial support for various reasons today. Geoff told us that the handful of people who work for the organisation are paid from bequests so that any money donated is given directly to those in need. He said there was no waste or unnecessary spending, for example when board members who are all voluntary go for a meal, maybe after a meeting they all pay for themselves, which is very reassuring with the way we hear some charity organisations are run. We had a collection for protestant aid on the night which raised €110 which Geoff was very grateful for. 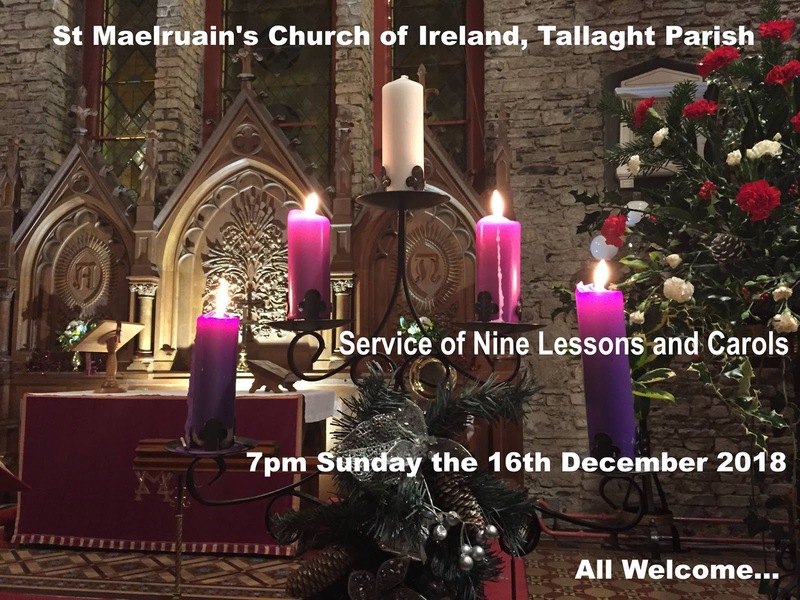 Our next meeting is on Monday 10th December when we will make our annual visit to Tallaght Leisureplex for ten pin bowling and a festive supper afterwards. Even if you can't play come along for the fun and meet up with friends for a great night. Please let me know if you would like to go as I need to let Leisureplex know for numbers and lanes. 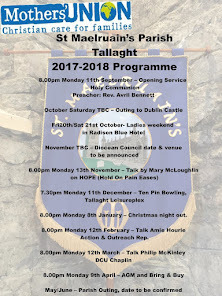 BIBLE STUDY of the readings for the following Sunday continue on Tues evenings at 8.00pm in the kitchen of Parish Centre, all welcome! CROSSROADS is a C of I Social Club for those in their 20’s & 30’s and a little older….They meet on the last Friday of the month in Buswells Hotel, Molesworth Street, Dublin. 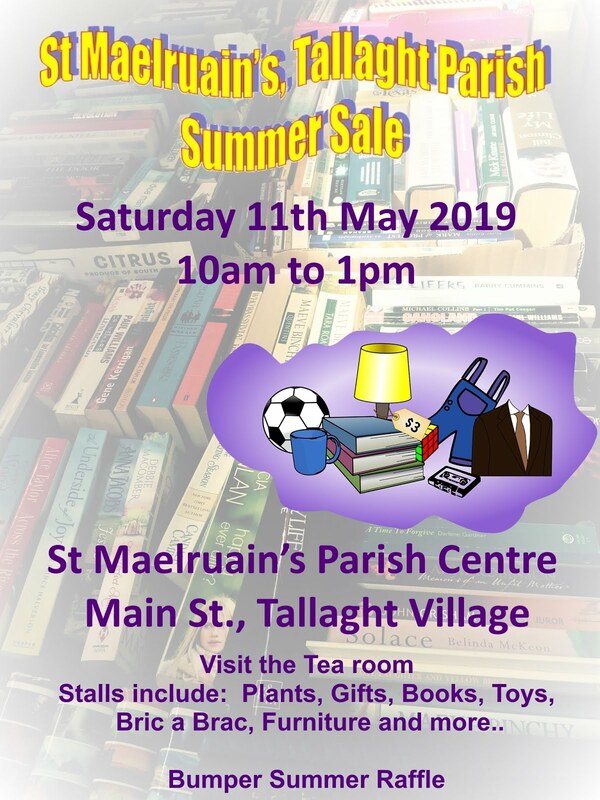 For details contact David on 085 7272 019. Follow them on Facebook, to join Crossroads Group, please send message request to Valerie Raitt Thomas or Beryl Healy.